If you weren't already aware, I'm excited to be hosting renowned cultural critic James Wolcott at The Miss Manhattan Non-Fiction Reading on Monday, October 6. This is how the event came to be. A memoir about living through the grunge of 1970s? Sign me the hell up. That's what I thought the first time I saw James Wolcott's memoir Lucking Out on the "Notable Non-Fiction" table at McNally Jackson. The cover was a grimy black and white photograph of one of New York's iconic bridges, tagged with the subtitle 'My Life Getting Down and Semi-Dirty in the Seventies' in grungy, typewriter-esque font. According to the back cover, Wolcott dropped out of college and arrived in New York with little else besides the money in his pocket and a letter of reference from Norman Mailer. I knew Wolcott for his work as a critic at culturally highbrow publications like Vanity Fair, The New Yorker and Harper's, yet had no idea he began as a gutter punk, so to speak, just like the rest of us. Reading Lucking Out gave me hope to know that one might be able to struggle in the depths of New York as a young person--not arriving a privileged son or daughter of American royalty or whatever its equivalent might be and bearing the fruits of nepotism and similar nepotic pursuits--and still end up not only a working writer, but a culturally relevant one; in other words, one could end up as James Wolcott. As soon as I finished the book, I knew I had to reach out to him, to say thank you for helping me know that at the very least I was moving in the right direction and that I wasn't going to drown in a see of my own hopeful metaphors. Seeing via Twitter that he was still located in New York, I decided I would make it my mission to meet him and talk to him about his work. I did my best to show that I wasn't some psychopathic non-fiction fangirl or other frightening specimen of literary junkie and said hello via Twitter. I would love to send you an email about your book. Miraculously, he responded with his email address and I wrote--I would love to get you a cup of coffee sometime. I included a link to my writing portfolio to show for further anti-psychopathic evidence, just in case. To be fair, the latter's never happened, though it's always something that sticks in my brain as a possibility, as if I live in some sort of 1950s-style magazine publishing drama about a young girl who comes to the city with publishing stars in her eyes. I do often fantasize about being Joan Didion, who found a similar fate being recruited to Vogue fresh out of college. But I digress. Needless to say, this certainly did not happen with Mr. Wolcott. He wrote back. He said he'd be happy to meet with me. After about four months or so of scheduling and rescheduling dates and times, we were to have lunch on the Upper West Side on an April afternoon. I looked forward to it all week, mentally compiling the sorts of questions I'd ask. And what would I wear? I worried that I would laugh really loud, which I do all the time, especially when I'm nervous. What sort of food would I order? How would James Wolcott feel about me ordering a thick, juicy burger? Was I better off on the chic, dainty salad route? The day of, I felt my heart pounding in my chest as I arrived at the restaurant. I was early, saw him enter, and went up to offer my hand which, to my relief, was not sweating profusely. Rereading this now, I fully acknowledge what an super-nerd I am. But if you met someone who is at the top of the field to which you yourself aspire, I'm sure you'd feel exactly the same. So just own it, and you'll be fine. I also spoke about my reading series (The Miss Manhattan Non-Fiction Reading Series, if you are not acquainted!) and without being prompted, he said, "You know I'm a very good reader!" Well, I said, I would love to have you! 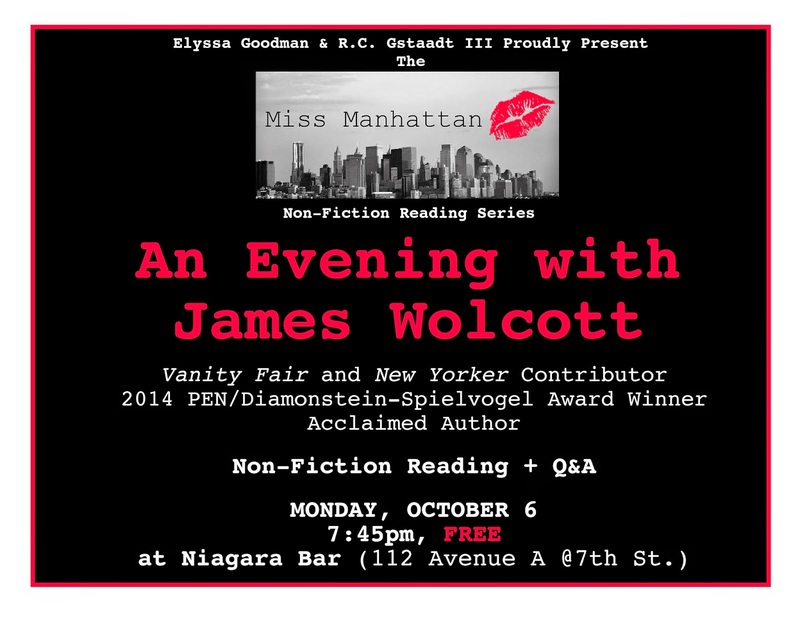 Eventually, we nailed down a date and now, I'm excited to say, if you haven't seen already, on Monday, October 6 at 7:45pm at Niagara Bar in the East Village (112 Avenue A at 7th Street) I will be hosting a special Miss Manhattan Non-Fiction Reading Series event, An Evening with James Wolcott. Mr. Wolcott, now a 2014 PEN/Diamonstein-Spielvogel Award Winner for the Art of the Essay, will be reading a few of his non-fiction pieces, discussing his writing process for each of them, followed by a Q&A with me and then with the audience (a little bit James Lipton-style, a la Inside the Actor's Studio, if you will). There's more information here. I hope you will be able to join me for this very special event! Feel free to reach out with any questions or comments, and please see below for a bit of Mr. Wolcott's biography. James Wolcott won the 2014 PEN/Diamonstein-Spielvogel Award for the Art of the Essay for his book, Critical Mass, a collection of his cultural criticism from publications like Vanity Fair, The New Yorker, Harper's Magazine, and many others. He has been called a "soulful cultural sentry" and "among the last of the great, garrulous, generalist critics, equally at home writing about TV, movies, literature, music, comedy clubs, you name it," by The New York Times; and "a cerebral antidote to the dullness contaminating our cultural pages," by The Daily Beast. In 2003, he won an American Society of Magazine Editors Award for his "Terror on the Dotted Line" and "US Confidential" stories for Vanity Fair. He is currently a columnist and cultural critic at Vanity Fair and also contributes to The New Yorker. His first job was at The Village Voice in the 1970s, where he was one of the first people to cover the punk movement. Wolcott is the author of the novel The Catsitters, published in 2001; Attack Poodles and Other Media Mutants, critiquing right-wing media, in 2004; the memoir Lucking Out: My Life Getting Down and Semi-Dirty in Seventies New York in 2011; and, of course, the acclaimed Critical Mass in 2013.